Here we have three brands known for their stylish luggage – especially luggage which is stylishly feminine – Lily Bloom, who offers designer fashion sense in combination with fresh innovative builds to make travel easier; Ricardo Beverly Hills, who offers a goal of matching thoughtful designs to stylish prints for any journey and any traveler; and finally, Samsonite Luggage who is better known for its design sense and use of modern trends and technologies. So, between these brands and their obvious trend toward innovative right-now designer luggage, which company should you choose to make your next suitcase? 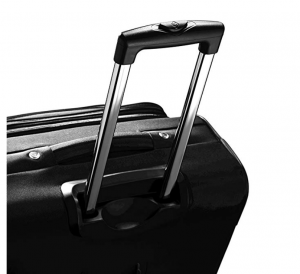 In reviewing these brands, we took a look at their top carry-on options which include an expandable designer suitcase from Lily Bloom, an ultra-lightweight expandable and stylish solution from Ricardo luggage, and a spinner wheel expandable design from Samsonite. 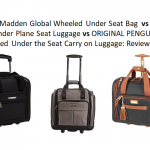 Side by side by side, we’ve placed these suitcases with nothing but the facts in hopes that you might see for yourself how a Lily Bloom carry-on holds up against these other excellent brands, or even how Samsonite and Ricardo luggage review against each other. After all, only one of these brands offers your next suitcase, and so choosing the best is a necessity. For your convenience we designed our research to fall into four separate categories that compare these three products against each other: Suitcase Storage, Materials/Durability, Additional Features, and Size/Style Options. It’s our hope that by breaking down the many suitcase specifics into organized sections listing what they have to offer, you can draw important comparisons for yourself as well as consider our opinion; this way, when it comes to choosing the right suitcase for you, ultimately the decision is yours based on your travel needs, the facts you’ve read, and the advice included in this guide. 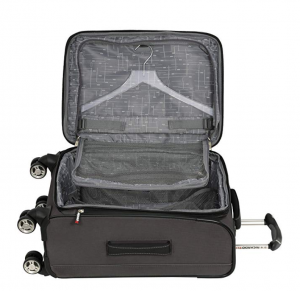 At 20-inches this suitcase boasts immediate extra packing space from just the outer pockets – of which there are three – these openings are zippered and incorporated into the suitcase front with two easy-access top pockets and one deeper bottom pocket which could easily fit anything as large as an extra sweater. Interior dimensions offer a minimum of 35 liters when not expanded (easily enough space for packing up to 3-4 days), with an additional 2-inches when expanded (or 15% more storage space). Interiors include two-tie down straps and a zipper roof pocket in the water tight lining. 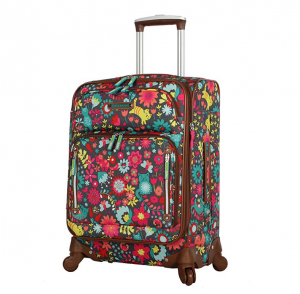 Typically, lightweight luggage is made from (lowest durability to highest durability) either polyester fabric, cotton canvas, or nylon materials; this one of a kind Lily Bloom is designed from a unique blend of mostly repurposed plastic bottles – making this a product of economic and nature friendly recycling – as well as an under lining of water tight polyester. The overall durability is close to cotton canvas and will protect your belongings very well against abrasions and drops. 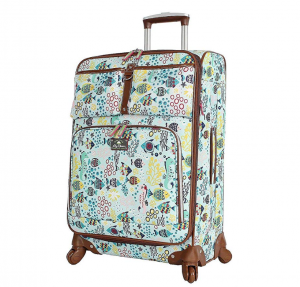 This Lily Bloom luggage carry-on uses only reinforced handle poles for extra strength and durability. 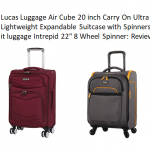 The 4 directional spinner wheels allow for 360-degree upright rolling in multiple directions so there is little weight on your arm, and also include top and side haul handles for easy and safe removal from overhead bins no matter your age or health. 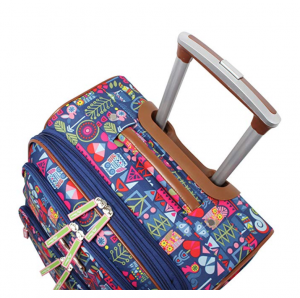 At face value and looking at just a single print, this suitcase is a beautiful piece of traveling art for the environmentally conscious modern lady! The carry-on measures in at 20 X 14 X 8 inches (not expanded) with a total unpacked weight of 7.8 pounds. Where style counts this brand receives major points for offering this carry-on in over 11 different and fantastic styles – our favorite’s tying between Origami and Sloth to Me Navy Blue. 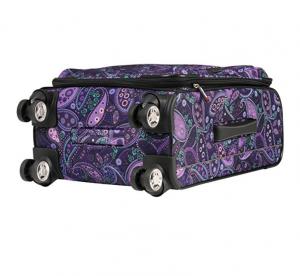 Nothing screams unique women’s fashion more than this one-of-a-kind Ricardo Beverly Hills original suitcase in Purple Paisley; the design sense is right there with Lily Blooms and features a stylish print which immediately catches the eye and would be impossible to lose at the airport or mix up with another passenger’s suitcase. Additionally, this look is more than just a personal aesthetic branding, it includes smart choices such as an 8-wheel spinner system for easy transport, an expansion opening, and even a thicker body with more padding. 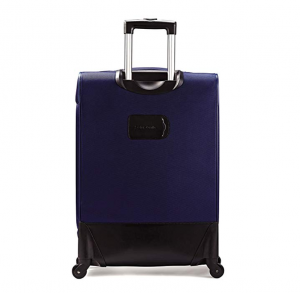 At 20-inches this suitcase features a main interior space with a minimum of 35 liters packing room and expansion zipper that adds up to 2 more inches of space for even more outfits, etcetera. Included on the inside are two unique tie-down straps unlike any other’s in the industry, and a deep and long mesh zippered pocket for added organization. The exterior includes added storage space with two zippered front-face pockets, the second lower pocket double the width and depth of the top zippered pocket. 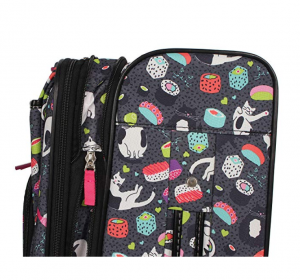 Made from a cotton canvas and polyester blend, this suitcase offers a medium durability which is great for standing up against most drops and abrasions and will protect your luggage in case you ever have to check it at the gate when an airplane is full. It’s a bit weaker than the Lily Bloom design, but still offers durable polyurethane wheels and a locking telescopic handle made from aircraft-grade aluminum. Overall, the structure is very impressive for such a lightweight design. 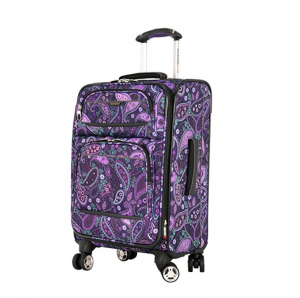 Added features include four upright spinner pieces which feature dual wheels that spin quietly and responsively in any direction using reinforced carry handles which are padded for extra comfort, or the multi-stage locking retractable handles which adjust to the height most comfortable for you. The ergonomically designed handle system features TPR grips that fit comfortably in your hand, and other perks like this include the pull of a zipper to instantly increase packing capacity, along with the purchase included 10-year limited warranty. 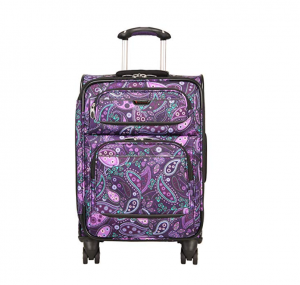 This suitcase measures in at 23 X 14.5 X 10 inches (not expanded) and includes only two style options which are Purple Paisley (a unique purple print on the polyester) and Graphite which is more business formal and even appropriate luggage for the business man as well as the business woman. 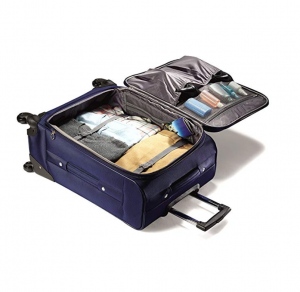 At 20 inches this suitcase offers storage with a 35-liter main packing space which can expand up to an additional 2 inches for 15% more room overall. Interior storage also offers two deep stretch shoe pockets and one mesh zippered pocket (the most interior organizers on this list). Exterior added storage includes a main face zippered pocket for an extra shirt, your tablet, or other organizable belongings. 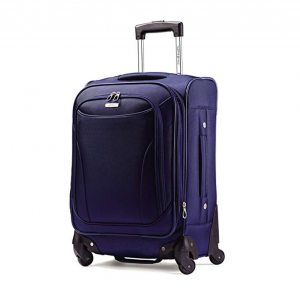 This suitcase is entirely made from polyester with an added outer coating for abrasion resistance; however, this suitcase still ranks medium-low on the durability scale and doesn’t come close to competing with the durability of the Lily Bloom or Ricardo Beverly Hills carry-ons. 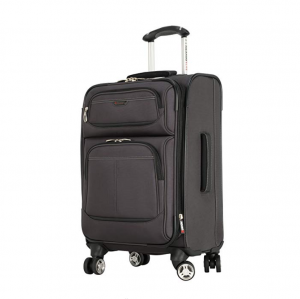 To its benefit however, this suitcase does come with durable polyurethane wheels and a aircraft grade aluminum telescopic handle. 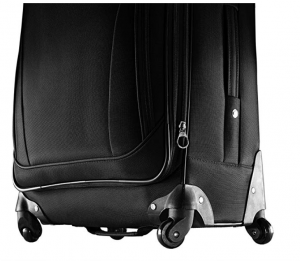 Ricardo Luggage includes four wheels for zero effort motion that allows 360 degree upright rolling in multiple directions with no weight on your arm. 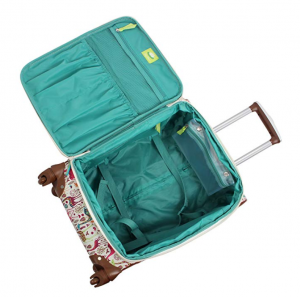 The suitcase includes a retractable handle that provides easy maneuverability when extended out from the suitcase, and stores neatly inside when not in use. It locks in place in both the fully extended and stored positions for secure traveling. Also, this product and all Samsonite products come with free shipping. The dimensions for this product measure in at 22.0 X 14.0 X 9.25 inches (not expanded) and the overall suitcase weight is approximately 9.08 pounds unpacked. Style options are as limited as the Ricardo option and include two main choices which are both metrosexual friendly and ideal for doing business or just traveling on pleasure. 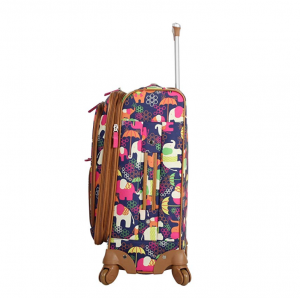 Of these designer bags its clear that the carry-on option from Lily Bloom has the most to offer overall with the highest durability, most style options, and great expandability with added exterior pocket to boot. 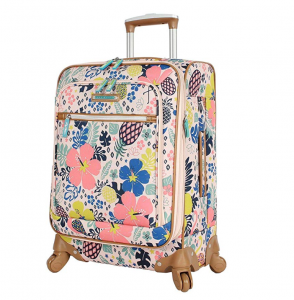 However, Ricardo Beverly Hills luggage is a close runner up and would easily match Lily Bloom neck in neck if it offered more style choices for the traveler wanting to match a suitcase to their personal aesthetic. For men and business women, the Samsonite carry-on comes in at a close third and is a fantastic pick for no-nonsense travel offering a better overall interior than the other two suitcases.